The MGPEI Annual dinner is the annual opportunity to meet up with some ‘old friends’, and catch up on the latest news and the events of the past year. This year, we have chosen the peaceful and relaxing setting of the Villa Corinthia Terrace at the Corinthia Palace Hotel, Attard as our venue. The mouth-watering menu which we have been offered includes a welcome drink, coffee and wine. The price per person is an exceptional €35.00. Please, find the menu included hereafter. The British High Commission has been invited to attend and shall be Our Guest of Honour. Understanding Lightning / Lightning Phenomenon. Lightning Protection Standards and product application (with a specific focus on protecting High Rise Buildings (in excess of 60 metres). Jason Leatherland is the Global Sales Support Specialist for ABB Furse and has over 17 years Earthing & Lightning Protection experience. Furse (owned by ABB) are a global leading manufacturer and supplier for Earthing materials & Lightning Protection products. 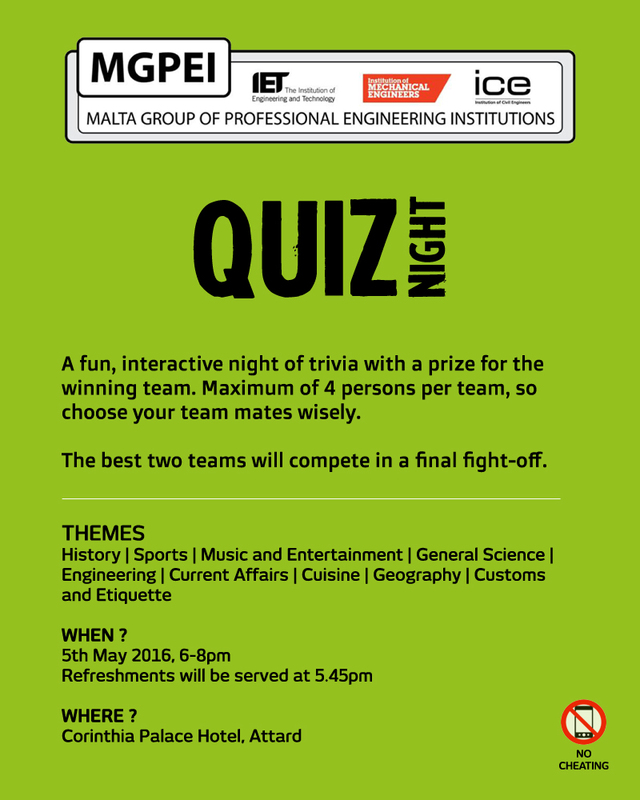 As part of the 200 year anniversary celebrations of the Institution of Civil Engineers ICE UK, the Malta Group of Professional Engineering Institutions representing the ICE in Malta, with the support of the ICE University of Malta Student Chapter is organising a Debate on ‘Gender in Architecture and Engineering’ in collaboration with the Gender Issues Committee of the University of Malta. As in previous years we are giving the opportunity to students, apprentices and young engineering professionals to represent Malta at the regional IET Present around the World Competition. Music is a means of communication between three parties – the composer, the performer and the listener, via a music score. Apart from the notes themselves, the score will also contain two types of information. One such type is the symbols that tell the performer how a note or a group of notes should be played. The other type of information envelopes impromptu expressive qualities which the performer decides to include in the performance. The attributes that make a piece of music come to life are changes to the loudness levels (dynamics), note durations (articulation) and tempo. A system that combines the written expression notation with the phrase structure of the music was designed. The output of such system consists of an interpretation of the music that contains expression in the form of changes to the dynamics, tempo and note articulation. This is achieved through a Kalman filter together with image analysis and performance examples obtained from live recordings of the Beethoven Piano Sonata Op. 2 No. 1. Listening experiments conducted show that expressions introduced by the system match the expected expressions according to the symbolic expressions found in the score as well as the expressions implied by the phrasing structure. More than half a million patients in the United States undergo $2.5 billion worth of procedures annually related to bone defect repair. As a result of enhanced life expectancy, these numbers are predicted to double by the year 2020, making bone the second most transplanted tissue across the world. Scaffolds, bone support structures that mimic the spongy component of bone, are crucial constructs in the modern approach to regenerative medicine, facilitating the surgeon’s task of exploiting the bone’s natural tendency to heal itself. Biodegradable metals have recently gained particular focus for use as bone regeneration scaffolds. Thus, the current work explores the possibility of creating macro-porous iron-based sponges using the polyurethane replication technique. This involves dipping polyurethane foam templates in a slurry containing metal powder and subjecting the foam to a heat treatment in which all organic material is burned-off while the metallic powder is sintered. The scaffolds, which also contain manganese and silver, are expected to offer MRI-compatibility, adequate strength and a controllable corrosion rate. Early results have indicated that powder metallurgy is a promising approach for the creation of scaffolds, as porous structures were fabricated with good densification obtained through the flow of silver via a liquid-phase sintering mechanism. Nickel titanium (NiTi) has lately been given ever increasing consideration for use in both internal and external biomedical applications. In particular, NiTi has gained widespread popularity for its use in self-expanding cardiovascular stents in virtue of its unique inherent characteristics, such as the shape memory effect and its ability to display superelasticity. Unfortunately, despite numerous successful clinical applications, the biocompatibility of NiTi remains controversial as a consequence of its high nickel content (~50 at.%). The release of nickel ions into the human body and surrounding tissues from a NiTi implant raises concerns as it is well documented that Ni promotes toxic, allergenic and potentially carcinogenic effects in vivo. Because of this, NiTi alloys are generally subjected to a surface engineering treatment prior to their use in the human body. Thus, in view of this, the efficacy of an innovative, low-cost surface engineering technique, that of powder immersion reaction assisted coating (PIRAC), to enhance the degradation resistance, and hence biocompatibility, of NiTi coupons via the formation of a well-adherent titanium nitride (TiN) coating is investigated. The corrosion properties of PIRAC nitrided NiTi coupons will be investigated via electrochemical techniques, including potentiodynamic testing, crevice corrosion testing and electrochemical impedance spectroscopy. Furthermore, the effect of the TiN coating on the shape memory effect and superelasticity properties of NiTi is of particular interest, and thus, this will also be investigated. Ground Penetrating Radar (GPR) is a method for analysing the sub-surface structure, and is very often used to verify and locate possible buried hazards, to identify the presence of any archaeological sites and also in the investigation of environmental conditions. Additionally, GPR can also be used to provide data for analysis in the preservation and restoration of heritage sites, non-invasively. During GPR measurements, reflected signals of the sub-surface structure are obtained, based on the dielectric contrast of different layers. Data is then post-processed to form images, depicting more information about the sub-surface layers. Post-processing the measured data requires an initial guess of the dielectric properties of the target material/images. In this study, a range of the dielectric properties including the permittivity and the permeability, with their respective uncertainty, of Lower Globigerina Limestone is presented for applications in cultural heritage sites in Malta. Samples were obtained from various boreholes across the island and dielectric measurements were conducted on samples completely saturated in water as well as fully dry samples. To reduce carbon dioxide emissions, the world’s focus is shifting towards clean energy sources. Therefore, the renewable energy resources are expected to grow continuously in the coming decade. Photovoltaic (PV) market is the fastest growing electrical energy generation industry with an average yearly growth of more than 40%. Over the last six years, there has been a rapid development in grid-connected Photovoltaic installations within Malta. Residential-scale PVs can help decarbonising our economies, but can also lead to technical issues, particularly in Low Voltage (LV) Distribution Networks. To quantify these issues, this work proposes a probabilistic impact assessment methodology and presents the first ever study on the Maltese islands on real LV electric networks located on the island of Gozo, considering real smart meter profiles in 15-minute resolution. The stochastic methodology uses a Monte Carlo technique for statistical evaluation of two extreme PV allocation scenarios, i.e. close to and further away from substation. The results analysed during one day with low consumption and high PV generation show that voltage challenges are more constraining while overloading of feeders is negligible. The proactive study illustrates considerably low technical issues caused by PV integration compared to other studies due to already existing infrastructure. Graphene, a monolayer of carbon atoms arranged in a hexagonal lattice, evoked a lot of interest in the scientific community since its first appearance back in 2004. Its discovery led Geim and Novoselov to receive the Nobel Prize “for ground breaking experiments regarding the two-dimensional material graphene”. Studying and understanding this nanomaterial unearthed its unique and intriguing properties; including its excellent thermal conductivity and superior mechanical and electrical properties. Since 2005, efforts for the efficient synthesis of high quality, large area graphene were made. In fact, after the Nobel Prize winning method of mechanical exfoliation was discovered, different synthesis routes were developed, including chemical vapor deposition, and chemical exfoliation. The substrate supporting the graphene has a crucial role in the synthesis and the subsequent fabrication of graphene-based components, primarily due to the fact that graphene has no bulk, meaning that all its atoms are in contact with this said substrate. Currently I am working on introducing slight modifications to the mechanical exfoliation technique, while also studying the effect of the substrate on the deposited flakes. The recent developments in this novel 2D material allow it to play vanguard roles in these constantly evolving times, offering ground-breaking solutions for prevailing problems while also introducing new possibilities. The need for orthopaedic implants is continuously on the rise. According to the American Joint Replacement Registry, in 2015, there was a 102 percent increase in the number of joint arthroplasty procedures, compared to 2014. Austenitic stainless steels are used in this application due to their good corrosion properties and their lower cost when compared to other metallic biomaterials such as titanium and cobalt based alloys. However, more than 90 percent of failures in orthopedic implants made from austenitic stainless steel are due to leaching of metal ions and localised corrosion, together with the effect of tribocorrosion. PVD is used to deposit coatings, to try and inhibit these problems. Previous work has shown that Cr-C coatings possess a combination of high hardness and toughness. Good corrosion resistance was observed, however, transpassive dissolution was recorded at higher potentials. By analysing the microstructure, mechanical properties and corrosion behaviour of heat treated Cr-C coatings, there is a strive to search for improvements in the overall behaviour of the coating to be used in orthopaedic implants. The addition of a coating of a few microns will extend the lifetime of the implant by miles, reducing the need for revision surgery. The doctoral dissertation focuses on isotope methods implementation for chronology using several measuring and dating techniques to provide reliable dates for further interpretations of sedimentation processes and pollution history. The present investigation conducted in several lakes and peatlands deals with two radioisotope methods – 137Cs and 210Pb to reconstruct recent sediment chronologies. Besides of the age-depth model application and verification presented in the thesis, the case studies highlighted the technical improvements for beta spectrometry. All the experimental work was carried out at The State Scientific Research Institute Nature Research Centre in Laboratory of Nuclear Geophysics and Radioecology, Lithuania. Dr Renata Mikalauskiene is a research assistant at the MCAST Energy. She has been recently conferred the Doctor of Physical Sciences degree at Vilnius University, Lithuania. Her research focused on applied methodologies in Environment studies. She has been part of the international Lithuanian – Swiss research team in a project on recent trends and related impacts on biodiversity and climate change. While studying for Master’s and Bachelor’s degrees Renata has undertaken these subjects in Environmental Engineering as well as written course projects among other subjects: Renewable Energy and Clean Technologies, Sustainable Development, Environmental Impact Assessment and Modelling of Environmental Processes. More recent internships at Renata’s initiative have been taken in Romania Babes-Bolyai University and Spain, Barcelona Autonomous University, have contributed in furthering doctoral dissertation. She has presented her project work findings, articles at international conferences and workshops on Environmental Engineering, Geology, Radioisotope methods on environmental archives. Her articles together with the co-authors can be found in Web of Science, ISI Proceedings, ISI Master Journal List and Council of Lithuanian Science periodicals, databases and reference lists. Our newly graduated Engineers are once again given the opportunity to give a presentation on the work that they have done in their Final year dissertation. Paradigm shift implies a fundamental change in approach. Biodegradable material are in fact a radical change in medical industry which is currently dominated by corrosion resistant implants. Fe-Mn alloy have been identified as promising candidate material for temporary implants, namely cardiovascular stents. These alloys display mechanical properties comparable to austenitic stainless steel of 316L type which is considered as the golden standard in the stenting industry. In addition, studies have shown that they display an intermediate corrosion rate between Fe (slow degradation) and Mg (rapid degradation). The primary objective of this research project was to analyse the effect of cold rolling, on the corrosion rate of TWIP (twinning induced plasticity) Fe-Mn-C alloy. The impact of protein addition, on corrosion rate was also investigated. This work concluded that the increase in cold rolling thickness reduction results in an increase in corrosion rate. However, bovine serum albumin addition did not have any statistically significant effect on the corrosion rate. The degradation mechanisms of the TWIP Fe-Mn-C alloys where also established. Although the material analysed did not fulfil the requirement to be used for biodegradable scaffolds, this research work provided the fundamental knowledge necessary for characterisation of specific, tailor made Fe-Mn based alloys for biodegradable implants. The use of infrared thermography in medical applications has increased in popularity in recent years. It facilitates the detection and examination of skin thermal signatures, under both normal and abnormal conditions. Thermal imaging may be dynamic or static in nature. In this study, dynamic thermography is employed since it monitors both spatial and temporal variations, making the acquired data more informative. However, issues including involuntary target movement and the dynamic temperature changes undergone by the target need to be considered. Two video registration methods based on the Speeded-Up Robust Features (SURF) algorithm are proposed and implemented in this work to address the primary issues associated with dynamic thermography. Following implementation, their performance was assessed both qualitatively and quantitatively, and a two-sample t-test was applied to verify that the difference between the mean errors per method was statistically significant. Dynamic temperature analysis was also carried out on the extracted temperature data in both the time and frequency domains, where cyclic patterns having different frequencies and magnitudes were observed across all participants. Such behaviour has not been documented in literature thus far, which implies that the biological significance of these patterns is yet to be determined. Remotely Operated Vehicles (ROVs) have enabled a wide range of applications spanning from underwater surveillance to maintenance and repair. From an engineering perspective, the design of such vehicles is governed by underwater physical conditions including elevated surrounding pressures, weak electromagnetic penetration depths and increased vehicle drag. In this dissertation, the design and preliminary implementation of an underwater ROV system is presented. This includes a mathematical model that enables prediction of underwater trajectories, empirical characterisation of generated thrust values and an electronic system that enables bi-directional exchange of data between the ROV and remote operator, navigation command inputs, propeller actuation and sensor interfacing. The testing of the electronic system showed that the navigation commands originating from the operator can be efficiently transmitted to the ROV over a single fibre optic communications channel while simultaneously transmitting back data obtained from the sensors onboard the vehicle. In terms of performance, the results indicate that whilst having a reliable communications link at lower transmission rates, increasing the transmission rates beyond certain thresholds will reduce the robustness of the link. It was thus concluded that the link operated without any errors up to a serial baud rate value of 115200. An innovative energy storage system has been proposed that stores energy by compressing air in a liquid piston accumulator, integrated with a tension leg platform. The primary objective of the project was to carry out a parametric analysis of the hydrodynamic characteristics of two prototypes of the proposed system. The first is a scale prototype developed by the University of Malta and Medserv plc., whilst the second is a full scale conceptual prototype integrated with a floating wind turbine. The analysis was carried out using the hydrodynamic analysis software package ANSYS AQWA®. The results indicated that the hydrodynamics of the scale prototype improve for deeper fairlead positions below the still-water line. With regards to the full scale hypothetical prototype, the better hydrodynamic behaviour was observed for smaller external diameters of the tension leg platform. Moreover, the dynamic characteristics displayed marginal improvement for increasing inner diameters of the umbilical connecting the air storage chambers in the floating platform and gravity foundation. In the manufacturing industry it is very important that products are produced as efficiently as possible. Having an inefficient process can lead to a significant dent in the company’s finances. The objective of this project is to improve the process of tampo printing on Playmobil’s toy figure arms. Solutions to eliminate the inefficiencies of this process are to be suggested. A methodology very similar to the DMAIC is used. First the problems are defined and then case studies are analysed to get quantitative data on the types and frequencies of the stoppages and on the mean down time. By creating a PFMEA, the most problematic stoppages are identified. The images below show a couple of examples of the stoppages noticed. These stoppages are further analysed and solutions to these problems are generated. These included modifying the injection moulding parameters, redesigning of a machine part and introducing new procedures. These solutions were discussed with the workers at Playmobil, and it was concluded that these will have positive outcomes on the printing process. From small remote controllers to large vehicles, batteries are found almost in every portable device. Batteries have taken a lot of various shapes and sizes since the invention of the first battery by Alessandro Volta in 1799. They nowadays come in lithium cells, pencil batteries or lead acid packages among other various forms. However since from they were invented, batteries have always caused some problems with regards to applicability as they lose their charge over time. Moreover the larger the current being drawn, the faster is the discharging process. Hence throughout time, the current required by a battery-powered electronic circuit was always minimized in order to reduce the size of the battery. All the aforementioned controllers were modelled and simulated with MATLAB® and Simulink® application packages. These were then implemented on an Atmel ATmega328P microcontroller. Our students are once again given the opportunity to give a presentation on the work that they have done in their Final year projects. The local construction industry tends to use traditional methods for delivering contracts. Few if any, are implementing the latest technologies and the same issues keep recurring during the construction phase. Lack of communication between the different design companies and the contractors leads to workability issues and substantial variations resulting in deadlines and budgets not being met. The latest advancement in the construction industry is Building Information Modelling (BIM). BIM has been implemented successfully in various countries during the past decade. This presentation focuses on BIM, particularly at the design stage and aims to find out its benefits for the local industry. This presentation focuses on the design stage with a good look into the design software to understand how it works and why it is beneficial for BIM. However, other phases are taken into consideration, with a case study on an existing local project where BIM software was used. When dealing with townhouses in Malta, it has been significantly difficult to find a balance between maintaining thermal comfort and yet providing adequate ventilation that aids the wellbeing of occupants. Ventilation has been long recognised to be crucial for enabling good indoor air quality and occupant comfort as a result of the fresh air that is provided. This study highlights how such residential stone buildings can have minimal retrofitting approaches in order to make use of passive strategies, along with the provision of a simple fan operated heat recovery improvised design system. The study focuses on the elimination of the current standard ventilation holes – that even though deemed necessary by local regulations for internal ventilation, are however uncontrolled and have proven to be main sources for heat losses and cold air infiltration in winter. Such evidence is supported by means of infrared thermal camera imaging and the use of data loggers so as to study their effect on internal temperatures, relative humidity and carbon dioxide levels. Furthermore, retrofitting of existing residences is essential in order to progress towards energy efficiency, carbon reduction targets and sensible mitigation of climate change. As the norm, most new buildings in Malta are apartment blocks. In fact, this presentation takes into account the most exposed living space available for users to buy – the penthouse, which is a highly sought after, so to say, apartment. The aim of this study is to determine the most thermally efficient and cost-effective insulation method between external and internal installation, while also taking into consideration the capital and running costs of each specimen and thus, comparing them to the normality of not having any insulation installed. The results were obtained by simulating every scenario with the use of the renowned Design Builder Energy Plus Software, with the five (5) results representing a traditional envelope built with HCB (Hollow Concrete Blocks) and a concrete roof without insulation, 30mm and 50mm internally fitted PIR on both walls and roofs, and lastly 30mm and 50mm externally fitted PIR on both walls and roofs. All these specimens are available in Malta, and as such, all specifications and pricing are derived locally. The continuous advancement in engineering technology and medicine have improved human comfort and life-expectancy. For instance the average life expectancy for the Maltese population currently stands at 82 years of age as opposed to circa 65 year old in the 1950’s. This gave rise to an ever increasing ageing population that effectively requires new technologies and social caring means to provide the elderly with sustainable living. Efforts can be directed towards providing the engineering technology for the support of independent living and/or enhanced support in specialised retirement homes. As part of the IMechE Global Engineering Debate the MGPEI will be conducting a debate to identify current and future engineering technological needs to sustain the ageing population with the theme, Healthcare Engineering for the Ageing Population. Mr Vassilis Exarchou, Sales Director for Philips Lighting in Israel and Malta, will give a presentation on the latest developments in lighting in various fields. During his presentation, Mr Exarchou will discuss the “Internet of Things in Lighting”, reviewing the latest developments in lighting in a range of environments, from the home to offices, retail, industry and stadiums as well as governments and cities. He will present various case studies from these different fields and give an introduction to Philips Lighting University, through which Philips offers a comprehensive range of educational resources, including webinars and online courses, to expand lighting knowledge. Mr Vassilis Exarchou, Sales Director for Philips Lighting in Israel and Malta, has a BA and MSC in Physics and Telecommunications from Athens. He obtained an MBA in Financial Derivatives on Modern Firms in France, a Diploma in Environmental Management and an Executive MBA for Financial Directors, International Finance in Greece and completed his PHD in Bioengineering and Biomedical Engineering in London. Starting as Research Fellow at CERN (Switzerland), Mr. Exarchou began working with Philips in 1997 as Sales Engineer (Fiber Optic Controls), moving to Product & Sales Manager Airfield Lighting/Automation/Controls in 2000. In 2010 he became Segment Leader Outdoor for Philips Lighting, moving to Commercial Manager PLC Greece & CY in 2011. He is currently Sales Director at Philips Lighting and holds the posts of Director and Member of Board of Directors at GMD Micro Fluidics as well as Executive Director at Revogen. Copies of the minutes, the Treasurer’s report and the Chairman’s report of the 55th Annual General Meeting shall be distributed during the meeting to those attending. *Only members of one of the parent institutions are eligible to vote and to be nominated on the committee. A significant challenge en route to commercialization of such novel photovoltaic (PV) technologies as organic PV (OPV) and perovskite-based solar cells is the development of devices combining high efficiency and operational stability. While the efficiency can be measured within seconds, the timescale for stability assessment may be of the order of months or years, raising the need for relevant accelerated stability tests. We suggested to use concentrated sunlight for accelerated studies of OPV degradation  and demonstrated experimental methodology that allows an independent control of light intensity (up to 4,000 suns) and the sample temperature during the exposure . This allows to study various routs of OPV degradation  and to separate light induced mechanisms from those controlled just by the cell temperature. Recently, we used this experimental approach for study of photochemical stability of halide perovskites MAPbX3 films (X = I or Br)  and their solid solutions MAPb(I1-xBrx)3 . The relevance of accelerated testing to standard operational conditions of solar cells was confirmed by comparison to degradation experiments under outdoor sunlight exposure. We found that MAPbBr3 films exhibited no degradation, while MAPbI3 and mixed halide films decomposed yielding crystallization of inorganic PbI2 accompanied by degradation of the perovskites’ solar light absorption. The rate of such decomposition was found to depend on light intensity, the halide content and the exposure temperature. The crystal coherence length was found to correlate with the stability of the films. Prof. Eugene A. Katz received his MSc degree in Semiconductor Materials Science in 1982 and Ph. D. in solid state physics in 1990 from the Moscow Institute of Steel and Alloys. He has research experience in field of photovoltaic materials and devices for more than 30 years. The topic of his Ph. D. thesis was “Atomic structure and electronic properties of grain boundaries in polycrystalline silicon solar cells”. In 1995, as a visiting scientist at the Israel National Solar Energy Center of the Ben-Gurion University, he started to investigate the growth, structure and photoelectrical properties of fullerene thin films. In 1997, he joined the Ben-Gurion University’s Institute for Desert Research and has been working in the Department for Solar Energy and Environmental Physics ever since (now as a full professor). His research interests include areas of applied solar energy, photovoltaics based on non-traditional semiconductors (fullerenes, nanotubes, conjugated polymers, perovskites), photovoltaic characterization of AIIIBV concentrator solar cells at ultra-high concentration of natural sunlight (up to 10,000 suns) and synthesis of nanomaterials by concentrated sunlight. He has published more than 100 peer-reviewed papers on these topics. Walking, sitting down and standing are some of the daily activities that are easily taken for granted. Yet such seemingly simple tasks involve the precise harmony of biological mechanisms inside the lower limbs. A key component in these mechanisms is the hip joint. Like any other biomechanical system, the hip is prone to medical complications, such as cartilage wear, joint inflammation and bone fracture. Such negative implications could lead the affected individual to implant an artificial prosthetic replacement. Biomechanical assurance of prosthetic hips is attained through meticulous testing inside mechanical hip joint simulators. In light of this, a new hip joint simulator is being developed at the University of Malta to augment research in the development of prosthetic hip joints. The underlying principle behind the hip joint simulator is to replicate the motion and load profiles typically exhibited during walking. Apart from the predominant flexible motion of the hip about three independent axes, thanks to its ball-and-socket geometry, it is also capable of enduring extravagant forces. The hip joint simulator will provide a means to assess the wear performance of new hip joint designs, as well as insight into their operational lifetime. Fe-Mn based biodegradable alloys have been identified as promising candidate material for temporary implants, namely cardiovascular stents. These alloys display mechanical properties comparable to austenitic stainless steel of 316L type. In addition, studies have shown that they display an intermediate corrosion rate between Fe, which has a slow degradation rate, and Mg, which degrades rapidly. Thermomechanical treatments play a vital role towards the microstructure and mechanical properties of the material. The objective of this project study was to analyse the effect of cold rolling, on the corrosion rate of TWIP (twinning induced plasticity) Fe-Mn-C alloy. The impact of protein addition, on corrosion rate was also investigated. This work concluded that the increase in cold rolling thickness reduction percentage results in an increase in corrosion rate. However, bovine serum albumin addition did not have any statistically significant effect on the corrosion rate. Electron back scattered microscopy was used for texture and misorientation analysis. The pole figures showed no evidence of texture evolution. However, grain misorientation increased with increase in cold work. The latter result together with post degradation analysis of ultrasonically cleaned samples helped to establish the degradation mechanisms in TWIP Hadfield steels. Shipbuilding companies face increasing challenges to produce light weight structures, generally achieved by welding multiply-stiffened thin plate structures to build the panels, decks and superstructures. Fusion welding remains the most common fabrication method for large, thin-plate structures. Welding involves a complex multi-physics thermo-metallurgical mechanical. The non-uniform expansion and contraction of the weld and surrounding base metal gives rise to residual stresses and permanent deformations. These might reduce suitability of the structure by either departing from the calculated stress or by changing the final desired dimensions. The mode and magnitude of residual stresses and distortion in a given case depends on design/manufacturing variables such as thickness, spacing of components, material, welding process parameters and fabrication sequences. Predicting the amount of residual stresses associated with the different welding techniques available provides a means of controlling unwanted shape distortions. Following such predictions, the best welding configuration, pre-processing and mitigation techniques can be employed to achieve the final ‘acceptable’ panel shape. This study identifies support tools that can be used for the prediction of residual stresses and distortion. The numerical models were used to optimize welding parameters, fabrication procedures, and panel designs. The applicability and feasibility of different mitigation techniques is also addressed. The MGPEI Annual dinner is the annual opportunity to meet up with some ‘old friends’, and catch up on the latest news and the events of the past year. This year, we have chosen the peaceful and relaxing setting of the Petite Pool at the Corinthia Palace Hotel, Attard as our venue. The mouth-watering menu which we have been offered includes a welcome drink, coffee and wine. The price per person is an exceptional €35.00. Please, find the menu attached hereafter. Founded in 1922, Socomec is an industrial group with a workforce of 3100 people. As undisputed specialists in UPS systems, mains supply changeover, power conversion and measurement, Socomec dedicates nearly 10% of its turnover to R&D. As a result the Group can achieve its ambition of always being one technological step ahead. During this presentation, we will talk about Socomec’s extensive range of electronic protection systems ranging from differential current relays of types A, AC and B to surge protection devices for every installation; being it mains voltage, photovoltaic systems, exposed sites, or electronic communication systems like Analogue modem lines, RS485, Ethernet, fieldbus etc. This year Socomec are launching a new generation of their Countis energy meters, this time with embedded ethernet. Gone are the days of protocol converters; these small modular devices will be connected directly to the internet network. Ms. Luiza Valadares Machado has a double degree in Electrical Engineering, the first from Universidade Federal de Uberlândia – Brasil and the second from INSA – France. In addition, she did a Master in Business Administration in Strasbourg Business School in France. She is now in an internal sales engineer in charge of the technical support team for Latin America and Southern European countries for SOCOMEC products (PCS and EE products) and is responsible for pre and after sales technical support for the commercial department for these regions. Matter is made of atoms, crowds are formed of people, and financial markets comprise transactions. To understand how each of these behave, we can only get so far by thinking at the top-most level in terms of the material itself, the crowd, and the market. The individual components are critical, and how they interact with each other often determines the overall behavior. Predicting how these types of multi-scale systems function is a grand challenge in science and engineering for the 21st Century. In this talk, I will show how research on the flow of gases and liquids at micro and nano scales has parallels with phenomena as diverse as the spread of disease and stock market returns. Jason Reese is Regius Professor of Engineering in the University of Edinburgh. His first degree was in Physics from Imperial College London, and his doctoral research was in Applied Mathematics at Oxford University. Following research positions in the Technische Universitaet Berlin and Cambridge University, in 1996 he became a Lecturer in Aberdeen University, and then Lecturer and ExxonMobil Engineering Fellow in King’s College London. He moved to the University of Strathclyde, Glasgow, as Weir Professor of Thermodynamics & Fluid Mechanics, and was latterly Head of the Department of Mechanical & Aerospace Engineering. In 2013 he was appointed to the Regius Chair in Edinburgh University, the ninth incumbent since its establishment by Queen Victoria in 1868. In addition to his engineering science research on non-continuum flows (particularly at the micro and nano scales), he is involved in the industrial application of fluid mechanics. He co-founded Brinker Technology Ltd in 2002 to commercialise novel leak detection and sealing systems for oil/gas pipelines and wellheads. A winner of the Philip Leverhulme Prize for Engineering (Leverhulme Trust), the Lord Kelvin Medal (Royal Society of Edinburgh), and a MacRobert Award finalist (Royal Academy of Engineering), Jason Reese is a Fellow of the Royal Academy of Engineering, of the American Physical Society, and of the Royal Society of Edinburgh. The high aesthetic requirements of today’s culture leads to an increased demand for straight teeth by both adolescents and adults. This need is addressed by the branch of dentistry known as orthodontics. Moving teeth requires not only an intimate knowledge of the anatomy and physiology of the tissues of the face, mouth and jaws but also an understanding of basic mechanical principles. These sciences are merged to allow the controlled application of force to teeth, in order to move and align them with maximum safety and efficiency and with minimal discomfort. Dr. Simon Camilleri PGCert(Lond), MSc(Lond), PhD(Lond), LDSRCS(Eng. ), MOrthRCS(Eng. ), FDSRCS(Eng.) qualified as a dentist from King’s College Hospital, London in 1981 and as a specialist in Orthodontics from UMDS Guy’s and St Thomas’ Hospital, London in 1990. His career spans both academic and clinical practice, being a former Dean of the Faculty of Dental Surgery of the University of Malta. He currently divides his time between postgraduate teaching in both the University of Malta and King’s College London and private practice in Malta. Throughout the millions of years of its existence, Nature has demonstrated that the need to evolve is a mandatory element for survival. Factual proof is provided by studying the evolution process of the animal kingdom. It therefore comes to no surprise that man, and the activities he manages, need to relate to this phenomenon too! …extending across to ‘business organisations’. Immaterial of the size or type of operations, any organisation must be well prepared for carefully undertaking an evolution process. Failing to keep up means you risk driving your business into mediocrity: very fast. What is worse, social media makes it so easy for people to say just “how bad you are”! Business Process Management (BPM) is a fundamental technique in defining and managing cross-functional business processes within organisations. This practice requires clear definition of end-to-end processes, their various necessary elements, rules and resources required that together deliver value to customers in line with expectations of service and/or product offering. The transformation from the more traditional vertical organisational structure to a process-oriented horizontal approach needs to be managed very carefully if one wants to avoid going through a daunting experience. Intelligent Business Process Management Suites, better known as iBPMS, solutions are available that enable organisations define their current and develop future-state business processes, execute business operations effectively and efficiently, and respond to rapid changes with much reduced IT expertise and effort. What more, iBPMS has the capability of integrating with legacy IT systems residing deep within many existing business entities. The scope of this presentation is to bring to light in a non-technical discussion, the importance of BPM and iBPMS tools. Ing. Joseph Micallef Joseph is an engineer by profession, with a particular penchant for guiding organisations along the road leading to operational effectiveness, value-adding activities, and customer-centric, high-quality performance through business excellence processes. His career, originating in manufacturing, involved his engagement along a very broad spectrum of industrial processes, which later expanded to encompass the services sectors. Within the manufacturing industry, Joe has occupied various senior management roles in Research and Development, Quality Management and Health and Safety. His corporate career developed primarily through the medical devices industry, and later within the high-tech electronics industry. Joseph’s consultancy experience started off with an experimental project in 1999. Since then, it has developed into a full-time professional passion that has seen him undertake successfully a very broad portfolio of projects, both locally and overseas. Joseph, who is also a Lean Six Sigma Black Belt, has a strong background in providing coaching or mentoring services, designed to facilitate the establishment of effective, value-adding and quality-driven business processes within organisations. A regular speaker and facilitator at a number of training seminars, workshops and conferences, he has trained hundreds of middle-management level and executive management delegates in Malta, Egypt, the UAE, Oman, Kuwait and Saudi Arabia. Joseph Micallef is the Chief Operations Officer at BEAT Ltd., a Maltese niche-based consulting firm specialising in the provision of project management, strategic advice and business transformation solutions. Since the invention of explosives there has been a requirement for their safe disposal, this requirement developed into the discipline of Explosive Ordnance Disposal (EOD) more commonly referred to as Bomb Disposal. As ordnance became more sophisticated and war became more industrialised the need for a specialist role grew. The Royal Air Force (RAF) developed its own bomb disposal capability in parallel with the Army and Royal Navy at the outbreak of the second world war. The RAF immediately identified its weapons technicians (armourers) as the ideal candidates for the role as they already had an understanding of explosives and munitions particularly air dropped weapons. Their primary role was to clear airfields of unexploded Ordnance (UXO) thus maintaining an operational capability; this is still one of their main roles today. RAF bomb disposal teams have seen service in numerous conflicts all over the world and were active in Malta during WWII ensuring that the airfields remained operational to provide vital air defence for the Island and offence operations. Colin Gauci Born in the Royal Navy Hospital Mtarfa Malta in 1966, Colin Gauci lived in Hamrun until he moved to the United Kingdom in 1972. He joined the Royal Air Force in 1985 straight from school and trained as an Aircraft Weapons Technician. His main roles during his 32 years’ military service were as a maintenance engineer on Harrier aircraft, Tornado aircraft, Aircraft Assisted Escape Systems, specialist support equipment, Military Air Accident Investigator, Facilities Manager, Compliance Manager and Bomb Disposal Operator. During his time in the Royal Air Force he gained a BA in Business, Diplomas in Mechanical Engineering, Facilities management and Information Technology, and became a Certified Compliance auditor in Quality Assurance and Health and Safety. Since retiring from the Royal Air Force his role now is in assurance and compliance applying the skills developed during his military service to his new role in the Facilities Management sector. Like in previous years we are giving the opportunity to students, apprentices and young engineering professionals to represent Malta at the regional IET Present around the World Competition. Chatting, browsing and keeping oneself updated with recent news have become second nature to human beings living in the 21st century, where one can be informed about anything by simply pressing keys on a standard keyboard or tapping on a crystal-clear touchscreen. Unfortunately, this luxury is solely accessible to those who are able to fully control their arms and fingers and subsequently, people with mobility impairments, such as ALS or stroke patients, are deprived of such media. However, recent technology has the potential of providing these individuals with an alternative means of communication by monitoring their eye movements using a sleek pair of glasses comprising three metal contacts at the bridge and nose pads. The acquired information could be processed and used to actuate commands that could range all the way from moving a cursor on screen, to typing on an ordinary virtual keyboard, or to interact with standard computer based applications. All of such tasks could be done using simple ocular movements, a technology which could not only revolutionise our conventional means of interacting with intelligent systems, but also allow the mobile impaired to integrate better with society, increasing their level of independence and quality of life. The Palace Armoury houses a large collection of original steel plate armour from the Knights of St. John. The objects are currently exhibited in unsealed showcases in a climatically uncontrolled museum environment which leads to active corrosion of the steel artefact surfaces. In the absence of proper climate-controlled showcases, this problem can be remediated through the application of protective coatings. In this work, alkoxysilane coatings produced through the sol-gel process are proposed as protective coatings for cultural heritage steel. The sol (coating lacquer) consists of silica nanoparticles that contain different alkyl groups; the higher the concentration and/ or larger the chain length of the alkyl group, the more water-repellent the coating. A coating material for application onto cultural heritage metal must conform to the following conservation guidelines: i) coating must offer protection over clean and corroded surfaces ii) coating must not change the aesthetics of the object surface iii) coating must be applied at low temperature iv) coating must be reversibly applied. Coatings deposited so far are about 1µm thick, colourless and transparent. Furthermore, electrochemical testing of the coating onto clean un-corroded iron surfaces revealed a 2-3 orders of magnitude improvement incorrosion resistanceof the coated metal surface compared to the bare metal. Walking, sitting down and standing are some of the daily activities that are easily taken for granted. Yet such seemingly simple tasks involve the precise harmony of biological mechanisms inside the lower limbs. A key component in these mechanisms is the hip joint. Like any other biomechanical system, the hip is prone to medical complications, such as cartilage wear, joint inflammation and bone fracture. Such negative implications could lead the affected individual to implant an artificial prosthetic replacement. Biomechanical assurance of prosthetic hips is attained through meticulous testing inside mechanical hip joint simulators. In light of this, a new hip joint simulator is being developed at the University of Malta to augment research in the development of prosthetic hip joints. The underlying principle behind the hip joint simulator is to replicate the motion and load profiles typically exhibited during walking. Apart from the predominant flexible motion of the hip about three independent axes, thanks to its ball-and-socket geometry, it is also capable of enduring extravagant forces. To put this into perspective, a typical walking exercise conducted by a 70 kg individual would entail load forces on a single hip equivalent to four to five times the body weight, i.e. approximately 300 kg! The hip joint simulator will provide a means to assess the wear performance of new hip joint designs, as well as insight into their operational lifetime. By the year 2030, due to the rise in age-expectancy and accompanying increase in frequency of bone-weakening conditions, total hip replacement surgeries will increase by 174%. Two of the most important facets of implant surgery are biocompatibility and durability, both of which are needed to prevent implant rejection, failure, and ultimately revision surgery. The longevity of total hip replacement implants is largely dictated by their susceptibility to degrade in vivo. Degradation is partly inflicted by the simultaneous action of corrosion and wear, a phenomenon termed tribocorrosion. Biomedical grade 316LVM stainless steel is a metallic biomaterial that, despite having very good corrosion resistance afforded by a self-healing nanometric passive film, displays poor tribocorrosion response which hinders its application in biomedical implants. Ongoing postgraduate research work at the University of Malta is currently focusing on the tribocorrosion performance of a surface treated stainless steel composed of a carbon-diffused layer, a cobalt-based metallic layer and a top ceramic coating. Results are showing that the introduction of a carburised layer beneath the 3 µm CrN ceramic coating provides better mechanical load-bearing capabilities and higher damage resistance. The treatment further reduces the friction coefficient between the two contacting bodies of the hip joint. This greatly reduces the effort required by the patient to move the joint and material loss. This novel surface treated material promises to be an ideal candidate for hip joint implants. These results are encouraging for the implementation of multi-layered coatings in clinical trials in the near future. Total knee replacement is the most effective treatment to relief pain and restore normal function in a diseased knee joint. Although the popularity of such a surgery is increasing, one in five patients are not completely satisfied with total knee replacement. One of the main reasons for this dissatisfaction is that conventional implants do not offer optimal fit, creating problems such as pain and motion limitation. Another reason is the wear of the polymeric tibial insert. The aim of this research was to develop a patient-specific knee implant which can be fabricated using additive manufacturing techniques and has reduced wear rates using highly wear resistant materials. The proposed design was chosen based on implant requirements, such as reduction in wear rates, and strong fixation. The patient-specific knee implant improves on conventional knee implants by modifying the articulating surfaces and bone-implant interfaces. Moreover, tribological tests of different polymeric wear couples were carried out to determine the optimal materials to use for the articulating surfaces. Finite element analysis was utilized to evaluate the stresses sustained by the proposed design. Finally, the patient-specific knee implant was successfully built using additive manufacturing techniques. The winner to this competition will be given the possibility to represent Malta at the regional IET Present around the World Competition. All flights and accommodation expenses will be covered. The winner will also have the possibility of winning the fantastic grand prize at the international final! MAR 9, 2017 - WHAT IS GPON AND WHAT CAN IT DO FOR YOU? Chatting, browsing and keeping oneself updated with recent news and stock markets have become second nature to beings living in the 21st Century, where one can be informed about anything by simple clicks or taps on large, crystal clear touchscreens. Unfortunately, this luxury is solely accessible to those who are able to fully control their arms and fingers and subsequently, people with mobility impairments, such as ALS or stroke patients, are deprived of such media. However, recent technology has the potential of providing these individuals with an alternative means of communication by monitoring their eye movements using a sleek pair of glasses comprising three metal contacts at the bridge and nose pads. The acquired information could be processed and used to actuate commands that could range all the way from moving a cursor on screen, to typing on an ordinary virtual keyboard, to interacting with standard computer based applications. All of such tasks could be done using simple gestural ocular movements, which could not only revolutionise our conventional means of interacting with intelligent systems, but also allow the mobile impaired to integrate better with society, increasing their level of independence and quality of life. This project involves an experimental study on Common Rail, Compression Ignition Engines. It mainly consists of two main parts; the development of a control scheme for the engine, and the monitoring of the Exhaust Gas Recirculation system. In the previous projects, several experimental studies as well as simulations were conducted on the same engine to determine key parameters of the fuel injection system; namely the fuel pressure, the duration of injection and start of injection. In this project these results were used to design and implement a system by which fuelling of a Common Rail Diesel Engine can be controlled by a programmable engine management for the use of Thermodynamics laboratory sessions. The control strategy was implemented through an electronic circuit which was developed to achieve fuelling dependent on the throttle position and the mass air flow ingested by the engine. The second portion of the project concerned the Exhaust Gas Recirculation monitoring, which is a system that reroutes a portion of the exhaust gas to the intake stream, in the aim of reducing the combustion temperatures, thus reducing NOx emissions. AISI 316LVM stainless steel is frequently employed in hip implants due to its characteristic mechanical properties and corrosion resistance, but it displays poor performance when subjected to corrosion-wear (tribocorrosion) processes at the bearing surfaces of the hip prosthesis. A plausible solution to this problem relies in the application of PVD coatings to the ball and socket joint. Two types of novel duplex coatings, Cr(N)/S and S/Cr(N) were thus deposited by PVD (Physical vapour deposition) on the biomedical alloy. The Cr(N)/S coating comprised an inner layer of PVD sputtered carbon S-phase with a CoCrMo matrix followed by an outer layer of Cr(N) while S/Cr(N) coating holds the same coating structure in reverse order. Tribocorrosion tests were conducted in full strength Ringer’s solution at 37±10 under reciprocating sliding conditions to mimic the human body environment. Results show that Cr(N)/S was the most effective in improving the tribocorrosion behaviour of the alloy at all applied potentials, in terms of reduced friction and Total material loss (TML). On the other hand, S/Cr(N) exhibited only a relatively small improvement in TML compared to untreated 316LVM under anodic potential. Despite numerous experimentations and measurements completed for both in vivo and in vitro conditions, there is still need for biomechanical improvements which can support hip prosthetic advancements. Finite element methods are the most predominant means of quantifying such physiological conditions. The aim of this study was to analyse the stress-strain distribution for a hip joint, through the simulation of a subjects’ physiological state. This was implemented through the modelling of a three-dimensional hip joint assembly, obtained from computed tomography data, done by means of Mimics software. The hip joint muscle, ligament and cartilage tissues were created in ANSYS. The articulating contact between the cartilages was defined, and the application of physiological loads and boundary conditions for a subject during single-leg stance, were applied. A load driven solution was executed by the application of loads and moments analytically determined according to the patients’ anthropometric data. The peak hip joint contact stress was obtained as 2.50 MPa. The latter stress value and the regions of articulating cartilage contact were in conformity to literature, which verified the credibility of the analysis. This study successfully met the biomechanical evaluation of the analysed subject by FEA, whereupon the analysis was recognised to be pathological. One of the fields of robotics that is experiencing major research and development is that of autonomous robot navigation. This reflects an effort to build mobile robots that are more dynamic and able to move purposefully without human intervention. The applications of such robotic systems include the use of autonomous robots for the exploration of environments that are hazardous or difficult to reach. Autonomous robots can also act as intelligent delivery robots in offices, hospitals and factory floors and as tour guides in museums. The robot used in this project is a commercial wheeled mobile robot named PowerBotTM which was developed by Adept MobileRobots. This robot was installed with the Robot Operating System (ROS), which is an open-source, meta-operating system for robots, and it encompasses a set of tools that facilitate the development of robotic applications. The main objective of this work was the design, implementation and testing of a system based on the ROS framework, that allows PowerBot to autonomously navigate a dynamic indoor environment without colliding with obstacles and people along its course. This had to be achieved using a preloaded map acquired by the robot itself. This dissertation focuses on the completion of a draw through open loop wind tunnel with implementation of an air control system for the test section and calibration of various parts used for the wind tunnel. A USA 35B aerofoil was manufactured and tested inside the wind tunnel test section by a sequence of tests. The readings generated were used in several calculations to extrapolate the correct data needed. Results such as graphs of the pressure distribution of the aerofoil were obtained along with rotational forces generated by the aerofoil were extrapolated from the readings. Moreover, air speed inside the test section was obtained from a specific test done. The data extrapolated from the readings was then compared to standardised data of the same aerofoil testing under the same conditions. The results were also compared to a CFD model which obtained a clearer indication on how the completed wind tunnel performed. A flow visualization aid was done to help other personnel seeing the flow over an object being tested inside the wind tunnel test section. EMG signals can be used in engineering as a potential source of control for prosthetic devices. In such applications, digital processing techniques are necessary to follow efficient and effectively the changes in the physiological characteristics produced by a muscular contraction. The study consists of different sections, with the first section covering in detail the effect of EMG baseline drift and noise of the system. This section also covers the best type of data processing to perform for achieving the most reliable finger movement classification. In this thesis, two methods are tested to evaluate different types of EMG signal acquisition techniques. The first method consists from placing five electrodes on the muscles which are most active when the respective finger is contracted, while the second method consists of placing six surface electrodes at the lower part of the forearm. Experimental tests showed that the second method provides the most stable results. This study also covers how a cost-effective EMG signal acquisition module can be used to control any external devices, such as prosthetic hands or an electric wheelchair. This is achieved by using the least components possible and by using less complex processing algorithms, thus reducing the power consumption and the costs of the MCU required. Imagine by just walking to work in the morning and back in the evening would be enough to power the lights at home. The average person during their lifetime does around 150 million footsteps. The latter translates to powering a house for an entire three weeks by just one person alone. This intriguing untapped energy resource is very innovative potential to harvest energy in an environmental friendly way. Energy can be generated literally underneath our feet. Powering applications within our city in a sustainable way is what engineers continually pursue. Vibration is at the forefront in terms of electricity production when compared to other sources of energy. Piezoelectric energy harnessing, is a practice used to create electricity from vibrations and remarkably enough, electrical energy can be converted to mechanical stress, which makes piezoelectric materials unique. The piezoelectric outcome is at full prospective in power creation when subjected to continuous changes in pressure and vibration, essentially in high traffic areas. Every time a tile is stepped on, pressure is created. In a raised flooring venue, the pressure acts on each of the four supports/pedestals situated in the corners. Piezoelectric material in the form of discs is located in the pedestals. By the footstep, the piezoelectric material is also compressed. Piezoelectric transducers are able to convert mechanical energy into electrical energy and vice-versa. With each and every footfall, pressure is created on the four supports of the raised flooring tile, compressing the piezoelectric material and generating electricity. The more the raised flooring experiences changes in vibrations, the more the potential to produce electricity. The future of renewable energy is actually piezoelectricity and electricity is just a step away. Energy Harvesting; it may just be one small step, however in aggregate and in the right place, 0.77W per step suggests that piezoelectric raised flooring may be the future of raised flooring, if not tiles in general! The wave energy potential in the sea has long been recognised throughout the years. It was estimated by the International Energy Agency that sea wave energy could in fact produce 10% of the global energy demand. However, so far a number of worldwide installations have been installed and is considered as a large untapped energy resources. A number of feasibility studies have been performed around Malta. Malta is a small archipelago in the Mediterranean Sea having wave heights around the islands between 0 meters and 5.5 meters. This paper analysis the potential wave energy around the coast of Malta in view of national energy targets. A time-domain model was developed to analyze the wind and wave data over a specific amount of time. The energy potential in the waves is calculated with different potential off-shore wave energy converters (WEC). An attenuator, an oscillating wave surge converter and a point absorber wave energy converters are considered to extract the largest amount of energy possible from the Maltese archipelago. Through the simulations carried out it could be seen that some technologies are preferred over others due to the overall energy performance. Automotive racing have gained popularity and has developed into a multi-million euro sport, attracting media coverage and commercial sponsorships. The application of aerodynamics in formula racing has evolved throughout the years to prove itself as being a crucial factor to win that extra lap time. The design and analysis of three distinct components were done for the aerodynamic package development of an FSAE vehicle, these being the rear spoiler, the under tray and the vehicle’s body. A mathematical model for both the rear spoiler and the under tray was made to indicate the optimal parameters in producing downforce, and the adequate type of airfoil to be implemented to the vehicle. The mathematical model of the vehicle’s under tray suggested that a ride height of 30mm, and a diffuser ramp angle of 10o produces the highest amount of negative lift coefficient. After establishing the airfoil needed to absorb a certain amount of power given by the vehicle, a two element rear wing was developed with the aid of using the guidelines of an AIAA (American Institute of Aeronautics and Astronautics) document. Further CFD (Computational Fluid Dynamics) simulations were done to the developed rear wing, determining the best flap element AoA (Angle of Attack) and gap height between the first and second element. From the results obtained, it was seen that a flap element AoA of 50o and a gap height of 14mm, produced the highest amount of lift. Several CFD tests and simulations were carried out on the vehicle’s body to establish its respective pressure distribution plots, and behavior of flow around the particular shape, including the vehicle’s side pods. Four vehicle configurations were designed to emulate the effects of having different aerodynamic components installed to the vehicle. From the results given, it was seen that a 98% increase in downforce whilst a 13.1% reduction in drag was achieved to the vehicle having the three aerodynamics components installed. The results obtained were compared to the vehicle configuration having no aerodynamic components. All the simulative tests carried out where inducted at a velocity of 90km/h. A CFD analysis was made on a single element USA-35B airfoil for comparative analysis to wind tunnel tests, to which the parameter compared and taken into account was the pressure distribution over the lower and upper surface of the airfoil for various angles of attack. The same design of experiment used in wind tunnel tests was utilized for the CFD analysis. At the end of this thesis, a CAD (Computer Aided Design) plan was created for the purpose of physically building the aerodynamic package, to be carried out in the future. The case study house is 1870’s three storey, property (area circa: 80m2 footprint) located in Birkirkara, Malta. The house is representative of the numerous other properties on the estate which prove more difficult to sell or let due to their age, construction and lack of maintenance. There are some 153,100 occupied dwellings in Malta, and their energy use accounts to around 30% of total Malta CO2 emissions. In addition, a substantial amount of about 70,000 are unoccupied dwellings. It is estimated that three-quarters of all the occupied dwellings will still be in use by 2050 with a target of over 90% CO2 reduction. In this paper, using a techno-economic assessment framework, a number of energy-saving measures are evaluated at the Birkirkara property including: advanced lighting devices and appliances, photovoltaics, wind turbine and energy storage. Based on annual calculations, the results highlight the kWh mitigated and its cost by each potential measure for mostly a 25-year period. The presentation recalls a visit by Perit Joseph Galea to the Asir Province in the South west of Saudi Arabia back in 1981 to document the characteristic, vernacular houses of the region. While the land and its people at the time are discussed, the focus is on the different types of dwellings that developed in response to the physical and climatic characteristics of the area and the cultural needs of the people. In recent years, development has caused many of these traditional dwellings to be abandoned. The photographs and images in this presentation have therefore acquired historical value. Perit Joseph Galea received his B.Arch. degree from the University of Malta in 1969. After a few years with the public works department he joined the staff at the then Faculty of Architecture and Engineering. In 1975 he received his M.Arch. degree. In 1978 he joined the faculty at the College of Architecture and Planning at the King Faisal University in Dammam, Saudi Arabia, where he stayed until 1985, finishing as Associate Professor and Head of the Department of Building Technology. From 1985 to 1998 he lived in Ontario Canada, practicing with several prominent architectural firms in Toronto. In 1998 he took up a position with the Government of Bermuda, eventually becoming Chief Architect. He retired from practice in 2008, returned to Malta, and has been a visiting senior lecturer in the Department of Architecture and Urban Design of the Faculty for the Built environment. Malta only looks at traditional consumption of water supplied by the public utility (mined from Ground and RO waters). Other water consumption, on islands, is not considered or ignored for national planning. Furthermore, because of a high population density, restricted agricultural hinterland beyond the urban areas, and scarce water, Malta’s economy has to import much of the food and goods it needs. To produce these goods, foreign water is consumed. Known as Virtual Water content in goods, it is of the order of several times that of the on islands water consumption, contributing when summed with on islands consumption to a high Water Footprint per capita per annum. As global water consumption rises with time, water resources globally are being placed under ever higher stress, degradation and pollution. This will over time put pressure on food and goods prices. Pressures include population increase, urbanisation, change of diets, climate change, etc. Malta’s economy will need to be highly efficient, transparent, with appropriate alliances to protect its vulnerability to pressures on global water. National planning of water will need to go far beyond the present traditional approach, and involve every sector of the economy. Malta not only faces challenges in managing its on islands water, but is very exposed to issues of increasing consumption of global water. Dr Gordon Knox graduated in Geology from University College London, and gained his Ph.D from the University of Liverpool working on the structure of the Andes of Peru. He had 28 years’ experience in the international oil and gas exploration business with Royal Dutch/Shell, working in a variety of geological settings and locations. In 2003, he was an International Distinguished Lecturer for the American Association of Petroleum Geologists on the topics of Risk and Uncertainty in Petroleum Exploration, and Ways of Working in Exploration; and also a Visiting Lecturer at the University of Malta in Applied Geology. Since 2004, he has given educational talks on various geological subjects and has developed a voluntary interest in Malta’s water situation and lectures and writes about the subject. He is one of the founder members of the Malta Water Association, formed in March 2011. He is a Fellow of the Geological Society. The Institution of Civil Engineers (ICE) established the Brunel International Lecture in 1999 in memory of Isambard Kingdom Brunel. Since then it has become a prestigious international event, covering topics ranging from Infrastructure, Technology for the 3rd Millennium, Sustainable Development, Poverty Alleviation, and Water in the World. 19:00 From Risk to Resilience: Practice made Perfect? Dr. Eelco H. Dykstra, M.D. The lecture will provide attendees with a unique and region-specific perspective on emergency management. Exploring the neuralgic role engineers have to play in dealing with extreme scenarios and the importance of efficiently collaborating with all relevant stakeholders, to ensure resilience of strategic infrastructure and cities as a whole. The lecture starts with the creation of a ‘Common Frame of Reference’ covering issues such as semantics and terminology, a few formulas, basic principles of risk/crisis communication and a brief forecasting exercise. A brief overview of the ‘Nine Universal Roadblocks’ Model will be given. These are universally lamented problems for which we seemingly have failed to find acceptable solutions. The audience will be asked to prioritize these roadblocks. The audience will be immersed in a “what If…?” scenario and be given an opportunity to offer conclusions and recommendations. The lecture will finish with a Q&A session, allowing the audience to discuss any of the points that have been raised. The Institution of Civil Engineers 11th Brunel International Lecture is organised in Malta by the Malta Group of Professional Engineering Institutions, representing the Institution of Civil Engineers, the Institution of Engineering and Technology and the Institution of Mechanical Engineers. The lecture is organised in collaboration with the Planning Authority, the University of Malta and the Building Industry Consultative Council of the Government of Malta. Eelco H. Dykstra, MD, is Executive Chairman of Daily Impact Emergency Management (DIEM). With thirty years of international emergency management experience in a wide variety of settings and a proven ability to effectively deal with European, US, African and Asian approaches to emergency management systems and their respective stakeholders, Eelco is an acclaimed presenter and motivator, particularly with interdisciplinary, cross-cultural and inter- sector audiences. Compared to past lectureships, a somewhat different approach has been taken, which puts proactive and interdisciplinary cooperation in front of existing and new audiences, with the aim of establishing a legacy system that will remain active and relevant after the series ends in early 2018. In addition to the lecture, an optional seminar and workshop will be offered at selected locations. Attendees of the lecture will receive a summary of the results of their feedback in the form of a DIEM Focused Feedback Report/Initial Trend Analysis. This presentation will attempt to answer the question of why Engineers choose to do what they do and what motivates them. It will be illustrated by personal examples from the speaker’s own career. Ing. Joe Camilleri graduated in 1977, and after a short spell in Malta, moved to England, working on several commercial and military projects before moving back to Malta in 1988 to take up employment with Tektraco Ltd. With this company, he was also responsible for several innovative projects in various fields. He currently holds the post of Managing Director. Copies of the minutes, the Treasurer’s report and the Chairman’s report of the 54th Annual General Meeting will be distributed during the meeting to those attending. Socomec has invested many millions of Euros in the development of a new, digital electrical measurement technology – Diris Digiware. They have drawn on the length and breadth of expertise within the company, from all around the world. Over forty of Socomec’s specialist R&D team members have been dedicated to the successful delivery of this transformational new technology. The major objectives of this development were to reduce the cost of the measuring point for new or existing installations, to reduce the configuration and integration time and, of course, to improve the performance levels. Socomec’s latest addition to their range brings together groundbreaking digital electrical measurement technology, from sensors to software, to deliver an unrivalled degree of flexibility to installations. Diris Digiware is a unique, fully digital, multi-circuit plug and play measurement concept, compact and quick to install, it provides the industry’s most accurate and effective metering, measurement and monitoring of electrical energy quality. Ms. Luiza Valadares Machado has a double degree in Electrical Engineering, the first from Univeridade Fereral de Uberlândia – Brasil and the second from INSA – France. In addition, she did a Master in Business Administration in Strasbourg Business School in France. She is now in charge of the technical support team for Latin America and Southern European countries for SOCOMEC products (PCS and EE products) and is responsible for pre and after sales technical support for the commercial department for these regions. Summer is the perfect time to meet up with some ‘old friends’, and catch up on the latest news and the MGPEI Annual Dinner is the that occasion. This year we are again holding the annual dinner at the tranquil and relaxing setting of the Petite Pool at the Corinthia Palace Hotel, Attard. The tempting menu includes a welcome drink, coffee and wine. The price per person is an exceptional €35.00. Hereafter, you can find the menu for your perusal. Since Qatar started developing its oil reserves in the 1950s, gaining its independence in 1971 and discovering natural gas it has become one of the richest countries in the world. This has led to its growth across all facets of life and resulted in the need for control which was set out in 2008 by the then Emir Sheik Hamad bin Khalifa Al-Thani in a comprehensive plan called Qatar National Vision 2030. This was consolidated with Qatar being awarded the 2022 World Cup in 2008 and a programme of unprecedented construction in a very short time span. In 2013 the Emir handed over to his son the current Emir Sheik Tamim bin Hamad Al Thani who is in control of the annual €40 Billion expenditure….until the drop in the price of oil. This Presentation provides an overview of Qatar, its development, construction and the way of life from an “Insider” expatriate with a flavour of “reality”. Michael Brewer is a Chartered Civil Engineer with more than 35 years’ experience in the building, construction, and development industries in the UK, Malta, Cyprus and Qatar. This has encompassed working for Consultants, Contractors, Government Entities, Developers, Operators and himself. He is proactive in developing his “Feeling Engineering” to enhance the link between the virtual and real worlds, and ensure that virtual solutions are not blindly accepted. He is currently working for White Young Qatar as the Client’s Representative for Facilities Maintenance on the Al Udeid Military Air Base which is home to the air forces of Qatar, the United States of America and others. Prior to his departure to Qatar he was a stalwart of the MGPEI committee and most notably as Chairman between 2003 and 2007. Educated at St. Edward’s College, Edward Said graduated as an architect and civil engineer from the University of Malta in 2005 where he went on to read for a post-graduate degree in architectural conservation. He worked for four years in the restoration team of the Manoel Island and Tigne’ project with AoM Partnership and now is a partner at Architecture XV. In 2012 he spent a year at the University of Bath reading for a Master’s degree in the conservation of historic gardens and cultural landscapes. A keen researcher on Maltese architectural history, Edward Said has written various papers on the subject and is the author of Subterranean Valletta. In June 2013 Edward Said together with other volunteers founded the Friends of Villa Frere with the aim of salvaging the remaining tracts of this once internationally acclaimed stately estate. Through this non-governmental organisation, the gardens have been studied and slowly being given a legible appearance so that posterity can appreciate its once marvelled splendour. Brimming with social history the section of Villa Frere under the care of the Friends are occasionally open to the public when special guided tours are conducted enabling one to acknowledge the invaluable significance of this historic asset. Natural forces (ocean waves, wind, etc) and human activities are constantly impinging on the Earth’s surface, causing it to vibrate with a spectrum of frequencies. This is known as ambient seismic noise. Less than 20 years ago, this constant background vibration was considered by seismologists to be only a nuisance, because it reduced the clarity of earthquake signals, which were the main interest. Recently, however, it has been realised that this noise carries much information about the rocks through which it propagates, very similarly to the information carried in earthquake signals. Unlike earthquakes, ambient noise is constantly present in large amounts and can be recorded anywhere. This presentation will look at the nature of ambient noise, and the techniques being utilised by the Seismic Monitoring and Research Group to extract from the noise information about sub-surface structure, local site response to earthquake shaking, and the dynamic behaviour of Maltese buildings. Dr. Pauline Galea was awarded a Ph.D. in Geophysics by Victoria University of Wellington, New Zealand in 1994. She is currently Head of the recently established Department of Geosciences within the University’s Faculty of Science. She is also coordinator of the Seismic Monitoring and Research group (SMRG). The SMRG researches a number of seismology issues, such as seismic hazard and risk, sub-surface imaging, site response effects, seismicity, structure and tectonics of the Mediterranean, earthquake sources and historical seismicity. Our new MCAST graduates are being invited, for the first time, to present to us the work that they have done in their Final year dissertation. Thermoelectric Modules (TEMs) are widely used for cooling purposes. This study involves the investigation of TEMs used for heating purposes. The proposed system consisted of nine TEMs, 3 heat sinks, oil reservoirs and an oil pump, all connected in series and powered by a DC supply. The system was exposed to sun. Solar heat was collected by the TEMs, and transferred to the thermal oil via the heat sinks. Oil was circulated using an oil pump. Three distinct situations were examined. The first test consisted of having the TEMs exposed directly to the sun. The second test consisted of having the TEMs encapsulated in a glass shell, while being exposed to the sun. The third test consisted of having the TEMs placed beneath an aluminium plate, while being exposed to the sun. This was a concept test to analyse the potential of smaller systems for heating purposes. Air hockey is a widely played sport and has been popular since the 1970s. Rules to this sport may vary but the basic concept behind it is that two players on opposite sides of a frictionless table try to strike the puck into the opponent’s goal area. One of the difficulties in playing air hockey is the dependency of another player. This project discusses and evaluates the development of an air hockey robot which is capable of playing in real time against a human player hence allowing an individual to play air hockey without the need of another human opponent. The aim is to design and develop an easily produced real time air hockey robot with minimal costs and which operates autonomously. This project involves the introductory research work from a series of proposed tasks addressing the analysis and control system development of Automotive Suspension Systems. The research carried out and presented in this dissertation focuses on the classical Quarter-Model Analysis. The current and future studies comprise involvement in analysis and build-up of the passive, semi-active and active suspension systems. Integrating various modes of control strategies for optimization of the system’s performance, in relation to a number of criteria such as ride comfort. This work focuses on the simulation, analysis of the passive and semi-active suspension system. Data is extrapolated and a comparative assessment between both systems is performed. An experimental set up is also performed where a scaled-down test rig of the actual quarter suspension is designed, manufactured and tested to analyse the response of the system with respect to the simulated values. Most components were manufactured in house at MCAST, whilst spring’s and dampers were imported. The current systems being implemented on the Maltese island are systems where several studies are carried out on the intersection, and fixed timings are defined for an ideal case of traffic flow. This system takes into consideration factors such as the maximum number of cars that can wait at an intersection before this becomes a detriment to the flow of other roads. A major disadvantage of this system is that whether or not there is a congestion, the timings of the system stays the same and traffic flow is not maximized. The aim is to make a study in order to find out whether neural network technology can be adopted in order to maximize the flow of traffic through an intersection by creating an adaptive system. This means that the system must analyse the traffic flow at all times. After having gathered some traffic data counts and simulated the neural network on the custom built simulator, it was observed that the traffic flow rate was higher than when tested under fixed timing conditions. This thesis is on the analysis and design of RF (Radio Frequency) amplifiers operating in the HF (High Frequency) and VHF (Very High Frequency) bands. The amplifiers were tested and their effects when tuning various parameters were studied, in order to extract the overall characteristics and behaviour of each individual component which make the amplifier. The aim of every RF amplifier circuit is to ensure its reliability and ability to function within the required specifications. So, along with this study, the characteristics of the RF amplifier were examined in depth and documented in order to analyze its performance at various frequencies. Also analytical methods were used to extract the mathematical model of certain devices. Beghelli introduced a smart way to cut Your energy bills in a multiple way by installing just one system, controlling Your LED-lighting applications. Beghelli SmartDriver allows You to save energy, to dim Your lighting systems, to program lighting scenarios, to control & adopt the dimming scenarios in line with actual ambient, to analyse Your energy consumption, to optimize Your lighting system performance … and much more. All steps in a user-friendly environment and based on simple automation. Beghelli SmartDriver system is designed for the implementation of different types of applications. Starting at Your house, bringing benefits to a school or to an office building, up to high savings in Your production facility or in Your hotel resort. Mr Ales Rychtar is the Export Sales Manager at Beghelli-Elplast. He has been in this position for more than four years. Ales has more than years of experience in the lighting industry. He has graduated as a mechanical engineer however, his fascination for light keeps him in the lighting industry. Mr Massimo Lolli is the Head of Technical Support Department at Beghelli S.p.a. He has been in this position for more than 3 years. Massimo has more than 10 years of experience in the lighting automation and also in the solar & wind energy generation industry. He has a degree in electrical engineering. Mr. Salvatore Fiaminco, Beghelli Sales Representative for Malta. Our newly graduated Mechanical Engineers are once again given the opportunity to give a presentation on the work that they have done in their Final year dissertation. In injection moulding (IM), the product development time is greatly influenced by the tool manufacturing stage. When using rapid tooling (RT) to manufacture tools for a variety of production volumes, the tool development time is greatly improved, when compared to traditional manufacturing techniques. Furthermore, this will greatly reduce the product development time, which gives competitive advantage over other companies which do not use RT. During fabrication, machining and use, composite laminate panels are subject to a variety of impacts, one of which is simulated by quasi-static indentation (QSI). QSI can cause barely visible impact damage (BVID), influencing the residual properties of the composite material. The compressive residual properties of composite laminate panels are determined through compression after impact (CAI) tests. The main aim of this work was to design, test and build a CAI test fixture (based on ASTM D7137M) for the determination of composite panel residual properties. Globally, hydro power plants using Kaplan turbines have an essential role in the sustainable production of electricity. These axial flow reaction turbines can be operated under fluctuating conditions thus allowing the use in various environments. By varying the pitch, fluid rotates the turbine generating electricity. The aim of the dissertation was to investigate the flow field and pressure distribution along a Kaplan Turbine using CFD. There are twenty-five percent of all adults that require hip or knee replacements, with obesity being one of the leading sources for these surgeries. Tribocorrosion combines the synergistic effects of corrosion and mechanical wear and it affects greatly the biomedical industry, resulting in major expenses and revision surgeries of hip and knee implants, causing discomfort to the patient. This has led researchers to investigate ways how these effects can be mitigated. The main objectives of this project were to investigate and compare the tribocorrosion response of untreated 316LVM, CrN and duplex CrN coatings in simulated body fluid conditions using reciprocating sliding configuration against an inert, alumina ball. Our newly graduated Architects & Civil Engineers are once again given the opportunity to give a presentation on the work that they have done in their Final year dissertation. This dissertation specifically focuses on the adaptability of glazed façades in a Mediterranean Marine climate such as Malta, at 36°N, where cooling loads are predominant over heating loads. It investigates the energy performance of three types of climate-responsive façades that could be retrofitted to an existing glazed façade. These are designed on a component level where the overall building performance can be optimised if each component is adapted to its unique position. Building performance simulation packages were used to determine the energy demand to achieve satisfactory thermal and lighting comfort levels when using both dynamic and comparable static installations. By analysing the results obtained, it was possible to compare a dynamic façade design approach to a conventional static façade. Strengthening of columns in buildings by retrofit steel jacketing is a widely developed procedure enabling this element to carry a heavier load. However, the effect on beam-column junctions is often overlooked when analysing and applying this technique. In view of this, this body of research aims at analysing the behavior of beam-column junctions when the latter is subjected to column axial loads. Fibres have been directly linked with the improvement of concrete and its brittle behaviour. This study investigates the use of shredded recycled PET fibres and their effect on various mechanical and plastic properties including shrinkage, by varying the fibre volume content and fibre geometry. Experimental procedures were followed to test the PET fibre-reinforced concrete specimens for compressive, flexural, unrestrained and restrained shrinkage performance. The winner to this competition will be awarded €150 and be given the possibility to represent Malta at the regional IET Present around the World Competition. All flights and accommodation expenses will be covered. The winner will also have the possibility of winning the fantastic grand prize of €1000 at the London international final! A cash prize of €100 will also be given to the runner-up of this first stage competition. The annexation of the Maltese archipelago to Norman Sicily in AD 1127 appears to have been characterised by a centralised coordinated effort aimed at increasing the hydrological and agricultural output of specifically designated countryside areas in north and northwest Malta. Known as viridaria or giardini, these agricultural estates had access to a series of perennial springs. Many of these originated from a series of man-excavated perched aquifer galleries, a number of which subscribe to qanat-type water extraction systems. This lecture seeks to investigate water gallery typologies and physiognomy, as well as the role these had in the transformation of the rural Medieval Maltese landscape. Keith Buhagiar is a Ph.D. graduate in archaeology from the University of Malta specialising in hydrology, medieval and Early Modern Maltese cave-settlements and their related water management systems, as well as rural landscape development. Dr Buhagiar is a visiting lecturer in palaeochristian and medieval archaeology at the Department of Classics and Archaeology at the University of Malta. Research interests include central Mediterranean, North African and Near Eastern water management systems, cave-dwelling and Mediterranean settlement location and distribution. Four of our newly graduated Engineers are once again given the opportunity to give a presentation on the work that they have done in their Final year dissertation. Magnetic levitation transport technology is being considered as the stepping stone towards the dynamic improvement in the transportation sector. A magnetically levitated train floats on electromagnetic waves and uses a non-contact magnetic propulsion system to overcome the limitations of the wheel-on- rail technology by drastically reducing the vehicle to track frictional losses. The aim of this project was to design and develop a magnetic levitation vehicle with integrated closed loop speed control and to study a possible alternative technique that can be used to achieve a high level of linear forward propulsion at the lowest possible on-board power requirement. One of the main sources contributing to CO2 emissions is the transportation sector, amounting to around 25% of the total European Union (EU) emissions. Several measures are placed from the EU in order to reduce these emissions. One of the measures imposed from EU is the introduction of Electric Vehicles (EVs). Including a total of 5000 EVs by the year 2020. The objective of this project is to model and investigate the EV charging effect on the national Maltese power network. This leads to an approximation of the possible number of EVs that can be connected to the existing power network infrastructure. Recent developments in artificial intelligence (AI) and swarm robotics have shown that collaboration amongst robots can have many benefits and practical applications. This field is still in its infancy, as most robots used in different industries are either static, or work independently. However, swarm robotics involves the use of small and mobile robots, capable of sensing the environment, communicate wirelessly together, and perform tasks as a team in an efficient and constructive manner. This leads to decentralized information, collective behaviour, and an overall robust system, where robots optimize their task as a collective, rather than stand-alone units. In the lab, small robots are used to provide a hardware foundation, as well as test the AI logic used in real-world scenarios, such as unsupervised military engagement. Triaxial Testing is commonly used to measure the mechanical properties of rock and soil samples by applying all round pressure to the specimen and loading it axially until failure occurs. This test consents researchers to find the shear strength and stiffness of the specimen. The aim of this dissertation was to upgrade the triaxial equipment at the Faculty for the Built Environment, which was operated manually and had minimal research applications. The main objective was thus, to design a system that could monitor and control all the different test parameters such as: pressures, displacement, volume change and load. In 2008 although an alternative site (ie at Zammit Clapp Hospital) for an oncology centre to replace Sir Paul Boffa Hospital had already been chosen and approved, FMS after conducting a comparative analysis concluded that the most feasible and equitable option was to set up a full centre at the Mater Dei Hospital at the site which at that time served as an unofficial car park. Since within one centralised location rests the dedicated technology and expertise to handle all the steps in the care pathway, from screening and diagnosis to therapy monitoring. As such with a full Oncology Centre at MDH this would not only improve care quality but minimize costs and facilitate access to cancer care. The Project was designed and managed in-house by FMS to NHS standards from its inception, application for the EU grant, the compiling of the Medical Brief, room activity database, patient and staff flows, architectural and engineering services design, all tender write-up, site management etc. to handing over. Keeping in mind that a full oncology centre not only simplifies the process for patients and family care , but it also helps the staff form a multidisciplinary team in a collaborative effort to fight and defeat cancer progression. The project which costed around €60M and covering around 26,000 sqm of floor area focused on 4 primary functions namely. 3. Diagnostic & treatment areas i.e. chemotherapy, haematology, paediatric, palliative Radiotherapy (4 Bunkers with 3 Linear accelerators) Treatment, planning areas etc. Thus the Architectural & Engineering Design had to be efficient with organization, quality & patient satisfaction in mind especially since it qualified for an EU grand as part of the ERDF 196. • BMS and Power Network Control Systems (PNCS) to control and, monitor all mechanical and Electrical plant. Ing Paul Vassallo MSc, CEng, MCIBSE, MIMechE, Eur.Ing for the past 13 years (up till last year – now semi-retired) has been the Head of Engineering Services for the Foundation of Medical Services (FMS) which is charged with the mandate of implementing and managing capital projects across the public health continuum. Few to mention are the Mater Dei Hospital and recently the design and built of the New Oncology Centre – i.e. Sir Anthony Mamo Oncology Centre. Paul has over 37 years’ experience in the design and application of building services engineering to various type of buildings both locally and abroad. In the eighties he worked as a service and commission engineer with the world renowned Trane Company of USA where he specialised on various refrigeration systems especially large centrifugal and absorption chillers. This took him to numerous countries in Europe and Middle East. Later he worked as chief engineer with Ploymetrics Ltd on the Ghar Lapsi and similar reverse osmosis plants before moving to specialise in system controls with Satchwell Controls of UK. In 1998 after passing all the UK Engineering Council examinations, Ing. Vassallo read for MSc with Brunel University and graduated with distinction in Building Services Engineering. He was later registered as Charted Engineer with the UK Engineering Council and since then has been a full corporate member of the CIBSE, IMechE and ASHRAE institutions. Besides sitting on various governments technical adjudication committees, from 1998 to 2009 he was a visiting lecturer on Environmental Control systems at the University of Malta. With the rapid expansion of the Internet, and its underpinning of the world economy, this presentation will seek to introduce the complexity of the challenge faced by nation states today. The borderless nature of the Internet and its decentralised governance has transformed the landscape for criminal activity. Acknowledging the transformative nature for economic growth, innovation and prosperity for all, Cybersecurity has been declared a top one priority by leading nations across the world. This prioritisation will continue to grow as we move into an ever increasingly connected world. Ms Lara Pace graduated from the Surrey Institute of Art and Design in 2006 in Documentary Photography. She has worked in the creative and educational industries in Europe, Africa and Asia. In 2010 Lara began working for the Commonwealth in various capacities, working on ICT4D, Internet Governance and Cybercrime and Cybersecurity capacity building. She contributed to the establishment and development of the Commonwealth Cybercrime Initiative – a programme designed to assist member countries to build capacity to combat cybercrime through a comprehensive, holistic and sustainable approach premised on the collaboration of over 30 international organisations. Lara is the lead on Strategy and External Relations at the Global Cyber Security Capacity Centre at the Oxford Martin School, University of Oxford. Fiber-reinforced self-compacting concrete (FR-SCC) combines the benefits of highly flowable concrete in the fresh state with the enhanced performance in the hardened state in terms of crack control and fracture toughness provided by the dispersed fiber reinforcement. Thanks to the suitably adapted rheology of the concrete matrix, it is possible to achieve a uniform dispersion of fibers, which is of the foremost importance for a reliable performance of structural elements. Balanced viscosity of concrete may also be helpful to drive the fibers along the concrete flow direction. An ad hoc designed casting process may hence lead to an orientation of the fibers “tailored” to the intended application, which is along the anticipated directions of the principal tensile stresses within the structural element when in service. This converges toward a “holistic” approach to the design of structure made with highly flowable/self-consolidating fiber-reinforced concrete (FRC), which encompasses the influence of fresh state performance and casting process on fiber dispersion and orientation, and the related outcomes in terms of hardened state properties. A thorough understanding is required of the mechanisms underlying the connection between mix-design and fresh state performance, on one hand, and the dispersion and orientation of the fibers on the other hand, also in the context with monitoring and prediction to achieve the anticipated structural performance. In this framework, this seminar will review the most recent achievements in the field and will focus on the research needs which have to be urgently tackled in order to address the use of this kind of advanced cement-based materials for high-end structural applications. Prof. Liberato Ferrara is a professor at the Department of Civil and Environmental Engineering, Politecnico di Milano, Milano, Italy. He is a visiting academic at the Department for Construction and Property Management, University of Malta, through the Italia-Malta Cultural Protocol supported by the Italian Government and the University of Malta. The prospect of transforming the existing building stock into sustainable buildings is often desired but dismissed as an unwieldy option. Whilst the technical challenges for doing so are wide and varied, from an environmental sustainability standpoint, such undertaking makes perfect sense. In this presentation Ing Mario Schembri will highlight the key issues and challenges associated with the ‘greening’ of existing buildings. On the back of 30 years of practical experience in the fields of engineering and the environment, the speaker makes the business case for delivering energy performing old buildings through the fitting of modern controls. Ing. Mario Schembri graduated in electrical engineering in 1986. He also holds a Master’s of Science Degree in Environmental Management. He is the owner and founder of the AIS Group of Companies, setting up his first company AIS Technology to provide factory and building automation. Today the company has grown into a prestigious engineering company, designing and providing its own solutions to a wide variety of local and international clients. The AIS Group includes other companies in other diverse fields including the environment. Mario set up AIS Environmental Ltd. in 1996, making it the first environmental consultancy firm in Malta and remains a guiding leader in its field. He has also been consulted on IPPC legislation and was the lead consultant for the state-of-the-art waste incinerator plant in Malta. Recent projects include the Delimara Power Station, the interconnector Malta-Sicily and impact studies by off shore and land-based wind farms. Ing. Schembri has also introduced to Malta the concept of EPR (Extended Producer Responsibility) by the setting up of the first Packaging Waste Compliance Scheme known as GreenPak followed later by WEEE Recycling Scheme. Copies of the minutes, the Treasurer’s report and the Chairman’s report of the 53rd Annual General Meeting shall be distributed during the meeting to those attending.